Seth Grodin provides a nice comment on the sophistication of truth and the fact we hide behind complexity in an effort to avoid our fears of failure. How my times have we heard ourselves or other hide behind a wall of complexity. Never underestimate luck. It happens. You jut have to be ready to be lucky. That is why you need the prepared mind. The basis for many a investment mistakes is having false beliefs. Always love this quote when quants want to get too precise. Do not miss the forest for the trees. I'd rather be vaguely right than precisely wrong. Get the odds in your favor. It is not about betting. It is about betting when you have an edge and you got to make your edge. Who cares if you pick a black ball or a white ball out of the bag? ... don't leave it to chance. Look in the damn bag and pick the color you want. 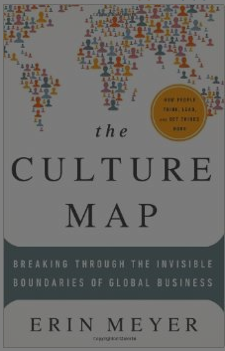 Finished reading The Culture Map - Breaking through the invisible boundaries of global business by Erin Meyer. This is an important book for any one who works with other groups around the world or markets to international investors. Culture matters. Different countries thinking and act different or more precisely they differ on a spectrum of behavior that can be measured. If you do not understand this cultural spectrum, there will a high degree of misunderstanding. 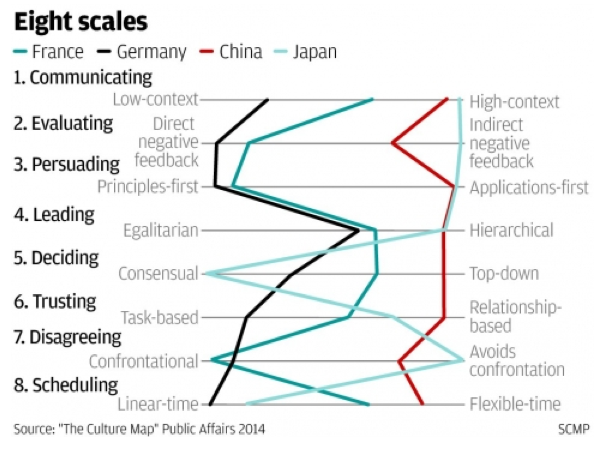 The insightful author breakdown cultural differences base don eight scales. Communicating - Does the culture speak in high or low content, that is, is there significant unsaid meaning in a conversation as is the case in high content? Evaluating - Is negative feedback direct or indirect? Persuading - Is form based on providing the formal principals employed or are the conclusions or applications presented first? Leading - Is it command and control or more democratic? Deciding - Are decisions made by the boss or through building a consensus? Trusting - Is trust based on relationships or through the effective completion of tasks? Disagreeing - Does the culture or accept confrontation? Scheduling - Are schedules flexible or very strict? The table below provides some differences in culture. It is a handy guide of what you may be dealing with when you market or work with others. It can also explain why you are not being understood by others around the world. This was an eye-opening book that breezed by quickly with good prose and story-telling. If you are a global businessman, you should read this book. "Considerable time" is the buzzwords from Fed Chairman Yellen, but putting some distance from the last Fed Meeting announcements makes me more uneasy about what these words mean. It really tells investors nothing other than there is a slow recovery and there is no reason to tighten policy through raising rates. The discussion always has to come back to a review of rules versus discretion and which creates more uncertainty. The Fed wants to have management flexibility but in so doing that there will always be more uncertainty. If you have rules but break them in the future, there is a loss of creditability. If you have discretion that is unclear there is less loss of creditability. The Fed can argue that it provided what they thought was useful information. It is unclear the current level of creditability with the Fed. Inflation expectations are stable and grounded around 2%, but it is not clear whether this is because of or in spite of the Fed. Fed clarity is still in short supply. "We are mindful of the potential for a build-up of excessive risk in financial markets, particularly in an environment of low interest rates and low asset price volatility. We will monitor these risks and continue to strengthen macroeconomic, structural, and financial policy frameworks, and other complementary measures, as the best response to managing risks, and meet our G20 exchange rate commitments." What kind of world am I living in when the G20 states that it is mindful of excessive risk that they created through excessive liquidity? Central banks created low interest rates and low volatility. Now they are going to watch and strengthen the frameworks to protect investors? This is code for more regulation and financial repression which will hurt investors. Central banks, by cutting rates to negative levels, created the "search for yield". Bank regulation created the opportunity for "shadow banking" which now needs to be better controlled. The G20 has created a risky environment and now want to change the framework to control the risks that they formed. In what world does this make sense? The investor advice has been to "not fight the Fed" and stay long to ride the liquidity wave. This will be good advice until it does not work. Reading the work of Antti Ilmanen on expected returns, (Expected Returns: An Investor's Guide to Harvesting), leads to a focus on his useful cube structure for looking at expected return differences. 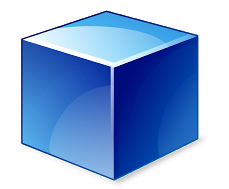 The cube is based on three different methods for looking at or classifying expected returns: asset classes, strategies or styles, and underlying factors. Asset classes - The world can be divided into four major asset classes: equities, sovereign bonds, credit, and alternatives. This covers the key alternatives available to any portfolio manager. Strategy styles - Value, trend, carry, and volatility. The expected returns of any asset class will be based on rich/cheapness, momentum, the yield or cash flows received and the sensitivity to volatility. Risk factors - growth, illiquidity, inflation, and tail risk. The macro factors include growth which drives sales and earnings, inflation which effects both input and output prices, tail risk which could be considered sensitivity to risk and crises, and illiquidity which is associated with the premium for holding assets that may not trade at key times. For each asset class there is a different risk premium based on its underlying characteristics. Equities will have a higher excess return than bonds because they represent the residual value of the firm. Bonds over carry but no upside beyond the principal of the bond. Credit will have a premium above government bonds, and alternatives such as commodities or real estate will have a premium that is unique given its sensitivity to different macro factors like the business cycle and inflation. A fist level of diversification should include a mix of all of the asset classes since they are not perfectly correlated and have risk premiums that will have different sensitivities to macro risk factors. Bonds will be negatively affected by inflation while equities should not be as sensitive if earnings increase with inflation. Strategy styles have unique risk and return potentials relative to the market. Value will change through time because to represents the price paid by investors for earnings. The trend or momentum style has shown to be unique from market risk and persistent through time. Carry represents the cash flows that are received by investors whether through coupon or dividends and will also vary through time. Different asset classes will have different sensitivity to volatility given the underlying optionality of each asset class. In the most obvious case, bonds such as mortgages that have embedded options will have a prices that move with volatility changes. Risk premiums will vary with volatility as investors demand lower prices for taking on more risk. Risk factors will also have significant impact on returns. Illiquid assets will need to have higher returns to pay for the factor that it may be difficult to sell these assets during times of stress. Inflation is a factor that can have a significant impact on nominal assets. Growth will push up earnings and will have an effect on real interest rates. Hence, there is a premium price for those assets which perform better in recessions and there is a higher return demanded for asset that will do poorly during times of financial stress. Tail risk represents the fact that many assets all do poorly in times of recession and during financial crisis. True diversification tries to spread exposure across all asset classes, strategies and risk factors. Thinking about one factor, strategy, or asset class will limit the set of opportunities as well as expose a portfolio to the only one set of risks. 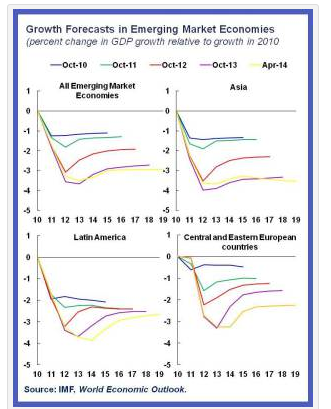 The graph shows the revisions in growth forecasts for emerging markets over the last few years. It is a one way story where economists have had to continually adjust downward growth expectations. While the link between economic growth and stock markets is weak, the general view is that growth is necessary but not sufficient for stronger equity markets. Growth provides the fuel for top-line sales and potential earnings. We have weaker growth, so without increases in valuation it is unlikely that we will see EM equities increase. Clearly the market believes that slower growth currently will have toll on equity levels. The headwinds are against EM equities. German finance minister Schauble is not going to be “led astray” by higher deficits, so Europe will not get help from German fiscal policy. They want to see structure reforms without spending money. This emphasis on structural reforms will determine the future of Europe. Regardless of the pressure placed on it from all forms of government institutions around the world, Germany has been holding the line on fiscal prudence. Only in the macroeconomic world will most believe that fiscal prudence is running greater budget deficits to increase aggregate demand and offset the "paradox of thrift". The macroeconomic religion says that you have to believe in fiscal multipliers that are above one and will stimulate private spending. 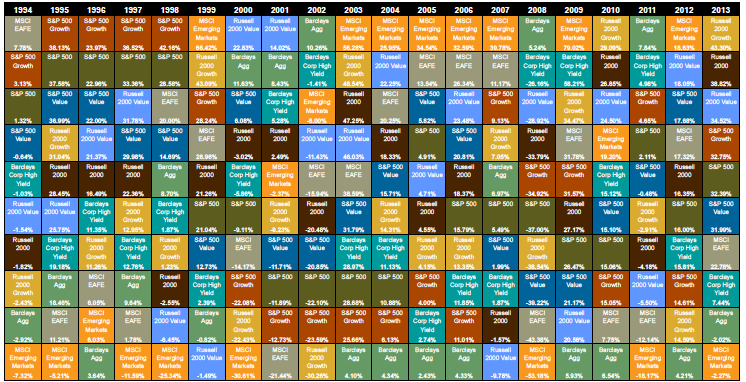 The Callan performance table shows the relative returns across asset classes for the last few years. We may see a significant change in the ranking this year. In fact, the rankings have changed significantly in the last three month. Bonds and stock returns had a significant divergence with bonds proving to be the much better asset class until a few weeks ago, but the gap between the major asset classes have fallen and the rankings are being reshuffled as we speak. This is an important time to do extensive portfolio reviews. The markets are in transition and waiting until the end of the year will clearly be too late. BOJ Governor Haruhiko Kuroda said "What's important is for exchange rates to move in a stable manner reflecting economic fundamentals. That doesn't necessarily mean exchange rates should always stay at the same level. Of course, they could fluctuate reflecting changes in economic fundamentals ... What's undesirable are for exchange rates moving in a way that deviates from economic fundamentals. From this perspective, I don't see any major problem with current moves." The usual view of interventionist central banks is that they will intervene if there is excessive volatility or deviations from fundamentals that are detrimental to policy goals. The BOJ is saying that the current yen decline is not a deviation from fundamentals and that the decline has not been excessive. Hold your short yen positions because the central banks thinks you are on the right side of the market. Alternative investments as a fixed income substitute? A Pioneer Investments "blue paper" called "It's all about your core" provides some good insights on why alternative investments may be an effective addition or substitute within a fixed income allocation. Investors will usually further diversify their portfolio within asset classes and not just hold Treasuries in their bond portfolio. In the case of bonds, investors will hold credit sensitive investments to gain diversification and yield against Treasuries. However, the gain in diversification within the bond asset class will actually diminish the amount of diversification across asset classes. Credit sensitive investments will actually increase in correlation with equities during a crisis. Simply put, the characteristics of bonds as a safe asset in times of a crisis apply to Treasuries but not to other types of bonds. This is an obvious but often overlooked issue with portfolio construction. In the first graph, the correlations of credit sensitive bonds to the S&P 500 equity index all increase during a crisis. 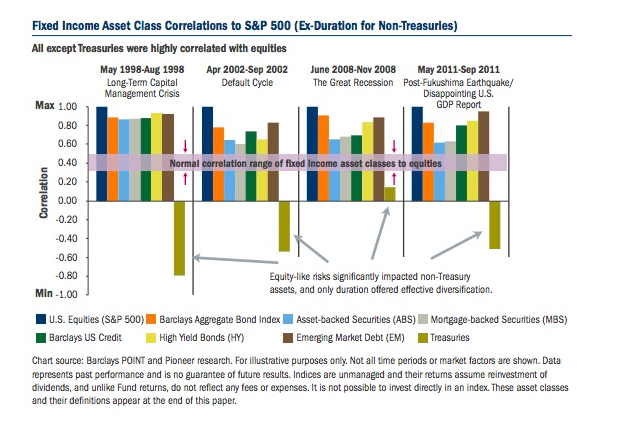 The correlation between equities and Treasuries turns negative or declines. The second graph shows the actual returns during these crises. The declines in credit product returns are substantial relative to Treasuries. In some cases, the decline in credit sensitive bonds is greater than the decline in the S&P 500. Credit is a problem in times of a crisis. So what can an investor do? The short answer may be to look at alternative investments as an alternative to credit sensitive investments in your fixed income asset allocation. Substitute low volatility alternatives for credit in the fixed income allocation. There may be an even stronger case for this substitution given the current low spreads in credit product. Now substituting alternative strategy risk for credit risk may lead to a different set o portfolio risks, but this paper does a nice job of providing another reason for reviewing alternative investments. An interesting number is the amount of money that has been saved because the Fed has been printing money through buying a lot of debt. The Federal debt has moved from $4.8 trillion in at the end of fiscal year 2006 and is now at $11.9 trillion at the end of fiscal year 2013. However, the interest expense has actually declined by $10 billion over that time as the average interest rate has fallen from 4.9 to 1.9 percent. This has been good fortune, but there is more. The 2014 budget deficit was $506 billion estimated. The Fed sent to the Treasury $53 billion during the year, but there is more help from the Fed. The reduced interest expense because of Fed was $356 billion, so the budget deficit without the help of the Fed would have been $915 billion. The Treasury pays interest on debt held by the Fed who then remits some of the money back to the Treasury. This is what the Fed policy is all about, not just what is happening in labor markets. You add the fact that banks have to hold liquid assets and you have increased demand for Treasuries. The deficit has become a non-problem as long as the Fed holds big Treasury numbers on its balance sheet. However, now that buying of new debt is over, except for reinvestment, we will see a new phase of the "21st Century Treasury-Fed Accord". The reasons for a dollar strengthening to continue is based on the simple case of monetary policy differentials and interest rate spreads. The dollar over the last year has been mostly range-bound but with more consistency of the view that rates will rise and the ECB in a loosening mode, the dollar has taken off. The result of a dollar rally is being felt across all global markets with EM selling off, the euro falling, and the yen plunging. The dollar may have gotten ahead of itself but the economics are all pointing in the same direction. The yen decline may be the one part of Abenomics that has gone right, or has it. The yen continues to fall which is what was wanted and needed for Japan, but much of this has to do with a strong dollar and the end of QE by the Fed as much as the QE program in Japan. The stronger relative economic performance in the US has also helped the yen decline. Japan inflation has not increased as expected. Japan now needs to see an increase in exports. The idea of a yen fall was to create an environment for greater exports and more growth. If you get higher import prices but no growth all you have is lower real income which is not the plan. There is a difference between a steady decline and a yen fall-off and right now we have the later. The US unemployment has fallen nicely since 2010. There are issues whether the labor market is truly healthy, but the labor dynamics have been positive albeit not at the pace desired by the Fed. In Europe, there has been a steady increase in unemployment during the post financial crisis period with only recently the numbers starting the fall. The sovereign debt crisis around the EU created a poor labor environment in away not faced by the US. The unemployment difference or gap of this unemployment change is high. The US is about 1% above 2008 levels but Europe is over 4% higher. Eurozone GDP is still below 2008 levels while the US is over 6% higher. The US has shown steady growth while Europe is only at 2011 levels. The ECB balance sheet as a percentage of GDP has actually declined since the end of 2012 while the US and and Japan have continued to increase. The UK levels have declined slightly. by this measure of correlation, the QE programs seems to have been effective relative to those central banks which showed more constraint. Interest rates have come down sharply in Europe with little to show for new investment and growth while US investment markets have been on one long ride higher. Core and headline inflation in the Eurozone are both below 1% which suggests that the threat of deflation is still real. The US inflation has been below target but does not seem to be headed for deflation. There economic gap between the US and EU is growing and the evidence suggests that the divergence between these economic zones is not going to decline. Asset markets will further reflect the economic differences. The ABS volume in Europe has been declining since the financial crisis. The market has shrunk even in the last three years while US ABS issuance has actually increased with the market over double the levels of 2010. There is a simple question of whether there is enough ABS for the ECB to buy and have a meaningful impact on their balance sheet and thus the economy of the Eurozone. There is also the problem of who will hold the subordinated debt or equity tranche of ABS issuance. If the subordinated debt is not sold, there will not be strong ABS issuance. An ECB program of QE should start to buy sovereigns if the intent is to really increase the balance sheet of the central bank, but this becomes a very technical problem of legality and mandate. The ECB ABS purchase program was a nice announcement, but the technical details make this more difficult to implement in a size that is meaningful. In the new regulatory environment, bank debt may be “bailed-in” or forced to take loses or be converted to equity before there is a taxpayer bail-out. This is not a new risk for banks in the post financial crisis environment, but it has not been formally included in the ratings process. Moody’s is going to create a "loss given failure" analysis. This will have a negative impact on the debt of bigger banks. This is just a proposal, but it would make holding bank paper more risky especially if the bank is an institution that is considered financial important and subject to systemic. So who would want to hold any of the new capital that has to be raised by banks at current prices? The price of capital should rightly increase and the size of the banking sector should shrink if the markets internalize this type of thinking. This is a good thing, but it certainly is at odds with the Fed policy of having banks lend more to improve the economy. So is there a coherent banking policy by the government? 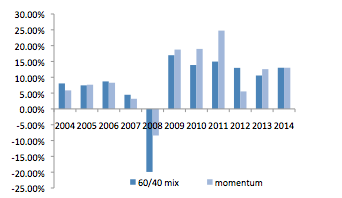 Momentum has been classified as two types: cross-sectional and time series. Most of the research and buzz has been about cross-sectional momentum whereby a large number of assets are ranked and a portfolio is created being long the top performers and short the poor performers. Buy the best and sell the worst. This can be done inside an asset class or across asset classes. The value at any time is buying the best given a ranking system of past returns. It is a tests of relative momentum preferences. The time series approach could be thought of as a ranking the performance of asset relative to past history. This has not been as extensively tested by academic researchers because it focuses on issue of market efficiency and past performance directly; however, if you go back through past research you will find a lot of tests. It is where most of the technical traders spend their time and effort. The hurdle may be higher than cross-sectional work but there is still evidence of success using momentum. It is a more absolute test of momentum and shows that momentum is present, but there will eventually be a reversal based on different timeframes. There is under-reaction and then over-reaction which leads to reversal and adjustment. The current rage in modeling is to combine cross-sectional ranking with times series performance to be selective in asset choices. Sensible German and monetary policy? German Finance Minister Wolfgang Schaeuble on focusing on stability policies, "Anything else would lead to a crisis of confidence ... That's the last thing we need in Europe in the current situation." The minister added, "It's no good to hold the central bank responsible for growth and jobs - it's doing what it can but it has basically exhausted its tools, as you can see from current developments ... Cheap money can't force growth either - otherwise we'd have no problems now." This is one of the key financial issues with the EU. German finance is still focusing on getting the fiscal house in order and expressing the point that monetary policy cannot do the job. Structural reform is the talk in EU, but it is not clear how it will be implemented. There are not consistent policies that can push growth higher. What causes asset price momentum? The answer to what causes asset price momentum is that there are a lot of reasons. However, no one has been able to decompose the impact of any one reason for momentum and given the reasons change through time, we can say that momentum will change across time and asset classes. We can also conclude there are broad set of reasons for why momentum may occur which helps to explain its persistence. Behavioral biases. There is a long list of behavioral biases which may induce trend behavior. The list includes: framing, anchoring of expectations, and extrapolation of expectations. Overconfidence issues which creates a willingness to hold more of what has gone up. Investors both under and overreact to information which will lead to longer-term adjustment in prices. Investors may have a hard time actually processing the many sources of information on the market. If there is not super rationality by the majority of investors, there will be room for behavioral biases to affect prices. Market frictions which stop prices from following their rational equilibrium. For example, information diffusion can lead to trends. 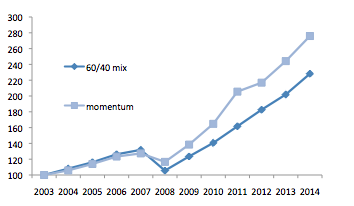 Risk premium stories where momentum is consistent with increasing or changing risk. Positive feedback or overreaction to markets; noise traders. The noise trades follow trends and past behavior and may outweigh the rational investors. This was a popular view in the late 80's. This can viewed as another way of invoking behavioral biases. Herding. This could be a viewed as the next generation of positive feedback models. If everyone is thinking the same or change their views at the same time there will be herding. The disposition effect. Investors hang onto their losers which places a wedge between market and fundamental prices. Prices will under-react to information which leads to trends. Markets that have had large capital gains will show persistence in returns. Risk factors and growth - the fundamentals. If fundamental trend there will be a trend in asset prices. For example, the same direction of monetary policy will lead to asset prices consistent with that policy. Easing will force short-term rates down. Fund flows. This is driven by many of the above reasons but flows will lead to price changes as demand changes cause a need for equilibrium price adjustments. This could be a liquidation effect when there is deleveraging. 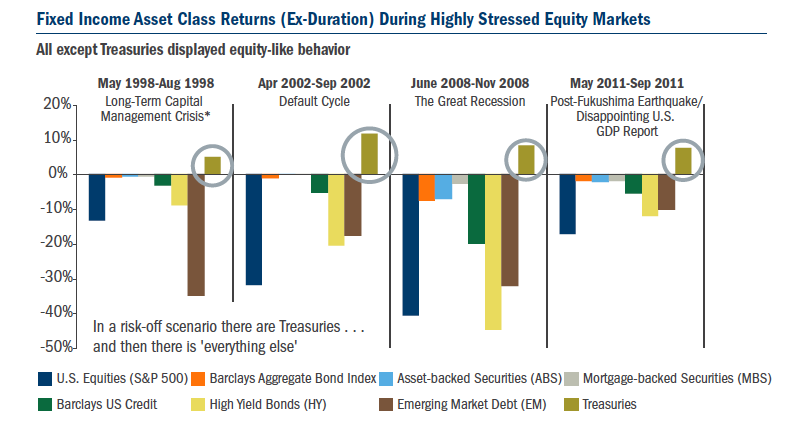 Clearly, there are a wide set of reasons for trends to occur in all asset classes. The representative household is averse to ambiguity which is Knightian uncertainty. Knightian uncertainty is that which is not measurable as opposed to risk which is measurable. Ambiguity averse agents lack the confidence to assign probability to all relevant events. Forecast dispersion is counter-cyclical so this ambiguity model can explain some of the behavior in business cycles. Confidence shocks will affect all major macro variables, so a loss of confidence can cause recessions. This falls into business cycle models that are based on pessimism but with more richness and detail. Agents come up with alternative beliefs that seem to fit the facts and then focus on the worst case in the dispersion of choices because they are adverse to this ambiguity. This type of model is consistent with time varying risk based on disasters, uncertainty, or forecast dispersion. So how do we use this type of model. It tells us that disperison of forecasts is important. Aggregate uncertainty is also important. Time varying risk premium are consistent with a lack of confidence. If investors do not know what is going on and cannot come up with consistent forecasts, macro aggregates will be decline, and by some measure asset prices will also be in decline. You need to incorporate sentiment in models to ensure that you capture this lack of confidence at critical times. Yes, European central bankers are different. If we go back in time, Europeans, just two and a half years ago, were actually raising rates. The impact was a slowdown in growth a year later. The context of these rate increases do not seem to be very compelling now. What is important is that the slow cautious behavior is in the process of being jettisoned as the ECB tries to play catch-up in a deflationary environment. The rate gap between the US and EU is zero, and there is no room for nominal rates to come down further. The result has been a strong decline in the euro. The story for the rest of the year is the divergence in monetary policy. Asset purchases are done at the Fed while asset purchases are ramping up at the ECB. The type of purchases will be different through and ABS program but the intent is the same. The ECB wants to be like the BOJ and the more like the Fed of a few years ago. Basis for equity optimism in one chart? I got this chart from more than one source, so it tells me that it has been making the rounds of analysts. 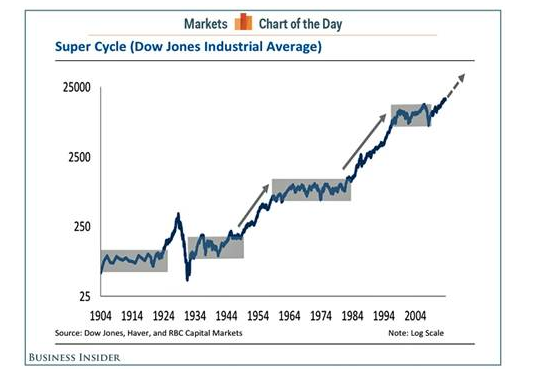 The argument is that the stock market has been on a long-term super-cycle and the trend is always upward. Be long stocks. There may be sideways movements which may last for years, but the those are just times to prepare for the next upward leg. I don't believe this, or at least I don't think this is a good argument to always be long the market. Equities should be a core holding, but those periods of consolidation should not mean sticking to the same old allocation plan. All of those sideways periods were times of economic upheaval and overvaluation. It just tells us that times change and we have to change with them. CME Rule 575, orders must be entered "in good faith and for legitimate purposes". Nice review by Gary DeWaal. This brings futures trading in-line with Dodd-Frank rules for other marketplaces. The high frequency business is going to change with adjustment to Rule 575. It is likely for the better, but the providing of liquidity is very complex and the law of unintended consequences is likely to be invoked. The key to liquidity is to have two way flow at all times so strong short-term reversals will not occur. To have liquidity, liquidity providers have to be compensated. How is this compensation provided if there are rules which limit market-making? Negative real interest rates are now present in five EU countries for maturities of 2 years and under. There are three more that are at zero. Germany has negative yields out to four years. What is most interesting is the level of market complacency about this issue. Investors are generally avoiding some of this debt but buyers are still out there. Governments have not been driven to strong action. I had a discussion with debt finance director for one of these negative yield countries and asked a simple question. Why would anyone want to hold this debt? He looked me straight in the eye and stated that deflation could get worse, so this could be a good deal. It is just as interesting on a broader basis that this same country is trying to cut their overall debt to GDP level. Who can complain about that, but if you can finance infrastructure projects at negative rates and growth is slow why wouldn't you do it as a way to increase aggregate demand? Fiscal multipliers are supposed to be higher at low rates. You would only want to focus on reducing the debt to GDP ratio if you believed that increases in government spending will not affect cyclical demand. Investors do not have many choices. Governments are not safe assets so you have to move to riskier assets or get out European investments. 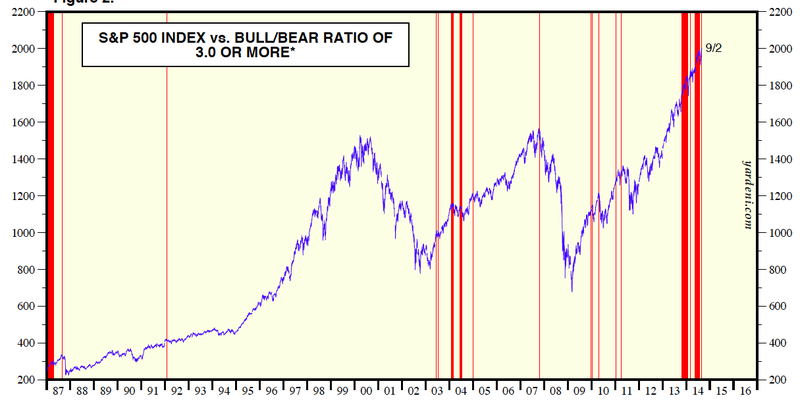 The II bull/bear sentiment ratio is over 4 times in favor of bulls. This is an extreme reading by any measure but a close look at these reading shows mixed evidence of what will be the impact on markets when we move to extremes. The charts are from yardeni.com. The top chart shows the strong bull bias in the market. You have to go back to 1987 to get a higher reading; however, periods of market extreme usually suggest periods of consolidation in a longer-term bull market. The largest bear market declines were not associated with strong extreme bullish readings. The extreme herd story is nice to tell but may not be a good signal. EIA oil import data are at the lowest levels since 1986. If you take out Canada, oil imports are at the lowest levels ever recorded by the EIA. 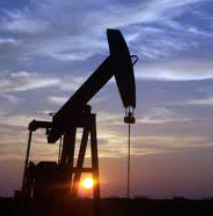 The oil boom is a huge impact on the US economy, the dollar and the global oil market. It is the new peace dividend. Without an oil problem, a number of geopolitical issues decline in importance. US growth is being driven by the oil boom. Capital expenditures and employment in energy is rising and the cost to run factories is very manageable relative to other parts of the OECD. The chemical industry is being significantly helped. The current account deficit is more manageable when oil imports are controlled. There is even more talk from the rest of the world that the US should "share" its new found supplies. Lifting the ban on oil exports is a real discussion point. All the impact is right there in the EIA data. Very broadly speaking, Europe's dependency upon Russian gas imports increases proportionately with proximity to its borders. So we have the Baltic States, which import 100% of their gas from Russia, Greece imports 56%, Germany 37% and the Netherlands 5%. The largest importers in aggregate terms are Germany and Italy, which constitute almost half of the EU's total demand (though the likes of France, Hungary, Czech Republic, Poland, Austria and Slovakia are all big importers, receiving over 5 billion cubic meter per year.) However, whilst Germany uses gas for just 20% of its overall energy needs, Italy uses gas to fuel almost half its power plants and is currently securing winter rates of more than EUR 2 per megawatt hour above those in northwest Europe. Italy suffered serious disruption during the previous Russian-Ukraine disputes back in 2006 and 2009 and it may yet have to look to pricey Algerian supply if the current dispute continues. This is an interesting take on the geopolitical issues associated Russia and Ukraine. The gas issue is very relevant. Sanctions have been imposed but there is limit to how much risk the EU wants to impose on its economies through the cost or disruption of energy. Geopolitics often play out in commodity markets.If it were not for commodity markets, many political issues would be ignored. Cross market information provides useful information on how markets may behave. The credit spread or risk premium above Treasuries tells us something about the supply and demand for credit sensitive investments as well as the default risk of levered companies. A simple analysis by the Market Compass blog proves the point. When spreads widen by even 25 bps in a 60 day period, the S&P 500 will generate negative returns. Similarly, if there is a tightening of credit spreads, the S&P 500 will have strong positive returns. This tendency is especially strong if the S&P500 index is already trending lower. The price of credit tells us something about market returns. It makes good intuitive sense that if credit becomes riskier, there will be a fall-out with the residual value of the firm. My guess is that this will be even stronger for small cap firms or those that are highly levered. We were asked to provide some simple model evidence on the quality of momentum and versus a simple balanced portfolio. We provide a simple case using only two assets. We use the 60/40 stock /bond combination as a benchmark. Use momentum indicator based on rolling six month returns. Allocation map will avoid negative momentum assets and hold positive momentum assets. If both assets (SPX and TLT) are positive, we hold the 60/40 mix. If both are negative, we hold half the normal allocation. If the stocks outperform bonds, we hold more stocks and if bonds outperform stocks, we hold more bonds. The minimum allocation for stocks is 30% and the minimum allocation for bonds is 20%. There is not a lot of variation from the benchmark. There is no shorting. There is no use of leverage. The gain in return is significant. If there is positive momentum, holding cash makes sense. If there is a bias in performance of one asset over another, favor the better performing asset. There is still diversification, but just some simple tilts. This simple model works with only one down year in ten.